A brand new, educational initiative designed to strengthen retailers’ and consumers’ understanding of the Bord na Móna Growise range of products. This training platform aims to create more informed, knowledgeable and confident champions for Bord na Móna Growise, to uncover the main raw materials that make up its award-winning products, along with their technical significance. 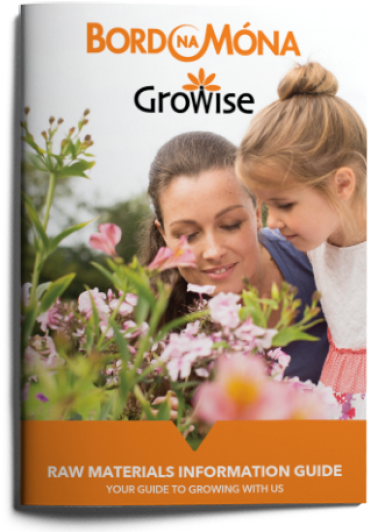 Bord na Móna launched the Growise brand in 2010, aimed at the retail market in the UK and Ireland. The range is at the forefront of developing top quality peat-free and peat-reduced growing media including multipurpose composts, specialist composts and grow your own planters. There has been much debate regarding the sustainability of peat, and the fact that it should be phased out as a growing media. Due to the high volumes of growing media required to replace peat, the choices to date are limited to four main raw materials. These are coir, composted bark, green compost and wood fibre. To help retailers and consumers understand Bord na Móna’s approach to high-quality, responsibly-sourced products, we created the Raw Materials Information Guide. Bord na Móna uses some other raw materials like sand, grit, loam, perlite, vermiculite etc., where they are used to bring specific benefits to products in its portfolio.